Sadler was born in Newmarket, the son of a racehorse trainer. He took up painting in 1954. As such this is a very early work. 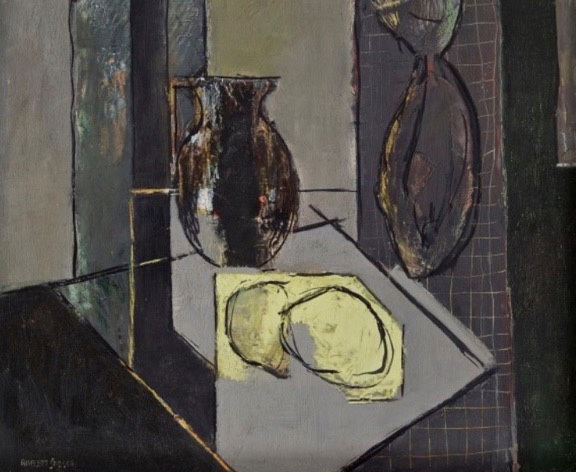 It is alsu unusual as being figurative; he later became a purely abstract painterHe was a member of the Winchester Art Society and the Cambridge Society of Painters & Sculptors. He exhibited at the Royal Institute of Painters in Watercolour, the New English Art Club, Ackermann’s Galleries, the Fry Art Gallery and in France. He lived in Aldeburgh.